Welcome to Pollapalooza, our weekly polling roundup. Women were one of the driving forces that helped propel Democrats to victory in the House on Tuesday. According to national exit poll data, 59 percent of women voted for Democrats and 40 percent voted for Republicans, which adds up to a record margin of 19 percentage points — nearly double the margin by which they voted for Democrats in 2016. And when we compare how women voted to how men voted — or the gender gap — we find a record-breaking 23-point difference, which is the highest it’s been since at least 1992. Granted, that might not seem like a huge jump from 2016, when the gender gap was 22 points, but part of the reason the gap isn’t larger this year is that more men moved to the left in 2018. But focusing on gender alone glosses over deep divisions along race and educational lines, and those divisions might be more meaningful than gender alone in explaining how women voted in the midterms. Today, let’s zoom in on how white women voted. First of all, more white women voted for Democrats in 2018 than in 2016 — this year, they split their vote evenly between Democrats and Republicans (49 to 49 percent), while in 2016 they voted for Republicans by 12 points. That’s a notable movement toward Democrats since 2016, when 43 percent of white women voted for Democrats, and 2014, when 42 percent did. But it also means that the main reason the gender gap leans so Democratic is that a large number of nonwhite women vote for Democrats (Hispanic women especially shifted to the left in greater numbers in 2018). If we go one level deeper and look at race and educational attainment, we see that white women voters were dramatically divided by their educational background. Exit polls found that white women without a college degree voted for Republicans by 14 points (56 percent to 42 percent), whereas white women with a college degree voted for Democrats by 20 points (59 percent to 39 percent) — a stunning 34-point gap. However, non-college-educated white women did move to the left this election compared to 2016, although not by much: In 2016, 35 percent voted for Democrats, a rate 4 points lower than this year’s. Perhaps this slight movement to the left among non-college-educated white women is a sign that education level is becoming somewhat less significant in determining voters’ party preferences. But for now, at least, it continues to be a major influence in how white women vote. There was also a clear urban-rural divide in the midterm electorate: Urban voters backed Democrats 65 percent to 32 percent, and rural voters backed Republicans 56 percent to 42 percent. Suburban voters split evenly. Young voters (18- to 29-year-olds) voted for Democrats by a 35-point margin this year. In 2016 House races, they voted for Democrats by a 14-point margin. 41 percent of voters said health care was the top issue facing the country, followed by 23 percent who said immigration, 22 percent who said the economy and 10 percent who said gun policy. 38 percent of voters said they cast their ballot to oppose Trump, while 26 percent voted to support him. Thirty-three percent said Trump was not a factor in their vote. 16 percent of respondents said this was the first time they had voted in a midterm election. Of that group, 62 percent voted for Democrats and 36 percent voted for Republicans. Almost seven in 10 voters said the they thought the economy was in good shape. A majority of voters — 54 percent — think the Russia investigation is politically motivated, and 46 percent disapprove of how Special Counsel Robert Mueller is handling the probe. 77 percent of Democrats want Trump impeached, according to a CNN analysis of exit poll data. 83 percent of voters said “recent extremist violence” was an important factor in their vote. Roughly 6 in 10 voters said they supported stricter gun control measures. President Trump’s approval rating is 42.0 percent and his disapproval rating is 52.4 percent, according to our tracker. That makes for a net approval rating of -10.4 points. Last week, his net approval was a little worse, at -11.2 points. 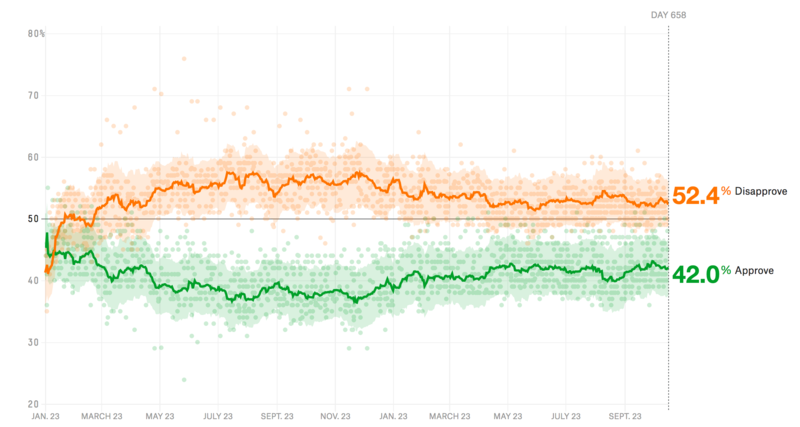 One month ago, Trump’s net approval rating was a little better: -9.5 points (42.5 percent approved and 52.0 percent disapproved). Check out our full analysis and results of the 2018 midterm election.